Showing 1 - 2 of 2 Products for Ignition Performance Module. Performance tuning is more difficult on Ford vehicles since the factory computer does not have a chip that can be easily replaced. 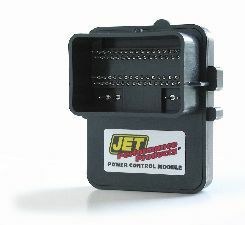 To solve the problem Jet developed a plug in module that attaches to the vehicle computer externally that can add up to 30 horsepower. The Jet Ford Module optimizes the ignition spark advance, air to fuel ratios and transmission shifting for the ultimate in power and mileage gains. Jet's exclusive Dynamic Spectrum Tuning provides optimal performance across the entire power band-not just at full throttle. Great for towing or SUV applications, all out street performance cars and everyday drivers. Daily drivers can use lower cost regular fuel for potential mileage gains, but for optimal performance gains use of mid-grade or better is recommended. Improves throttle response, acceleration and low end torque. Simple, plug-in installation in less than 30 minutes. Also works well with aftermarket intake and exhaust systems, mass air sensors, TBI spacers, etc. 50 state smog legal.